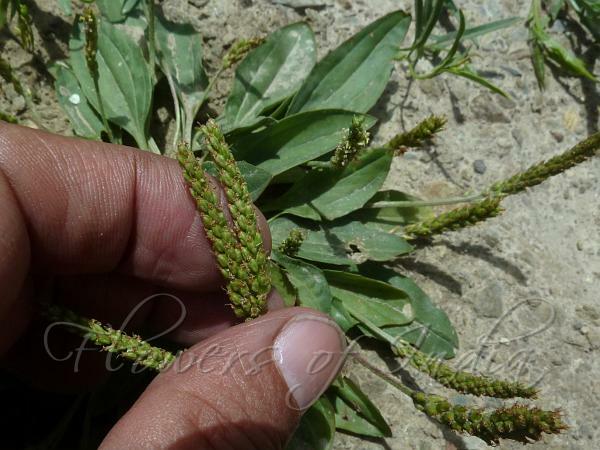 Himalayan Plantain is a perennial, stemless, hairless herb with short thick, up to 2 cm long rhizomes. It is characterized by a rosette of basal leaves, usually carried on a short stalk. Leaves are 2-6 cm long and 1.5 to 3 cm wide with 3 or 5 ribs, the margin may be more or less serrated. The inflorescence is an erect spike, 2-5 cm long, carried on a 10-17 cm long, leafless flowering stem. Plantago himalaica is closely related to Plantago major in the form of leaves, scapes and spikes etc., but is distinguished by having a stipitate calyx and comparatively smaller, usually stalkless, sometimes shortly stalked leaves. 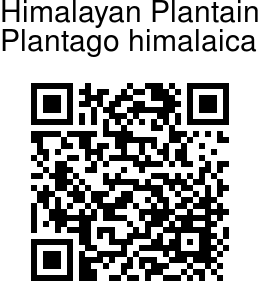 Himalayan Plantain is found at altitudes of 2900 m and above in the Himalayas, from Kashmir to Nepal. Medicinal uses: Leaves slightly bruised, are applied on wounds. Oil from the seeds is antimicrobial, for chronic diarrhoea and shigellosis, a bacillary dysentry.